Missing teeth can hinder both the beauty and health of your smile. The skilled and knowledgeable dentists at Cobblestone Park Family Dental can help restore the integrity of your smile using several types of dental restorations, including a dental bridge. Dental bridges are one of the most durable restorations we offer because they consist of an artificial tooth supported by the surrounding teeth. Designed to match your natural teeth, dental bridges will fit seamlessly into your smile. If you have one or more missing teeth and wish to enhance the health and appearance of your smile, consider a dental bridge with the dentists at Cobblestone Park Family Dental. Candidates for dental bridges are individuals who have one or more missing teeth. 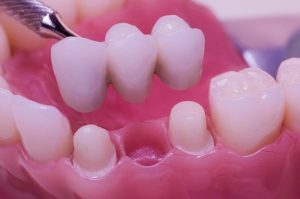 Because dental bridges are supported by surrounding teeth, the teeth adjacent to the gap (on either one or both sides) should be generally healthy or in need of dental crowns in the near future. The gums should also be healthy. A conventional fixed bridge is made up of an artificial tooth, known as a pontic, supported on either side by a dental crown. Dental crowns are placed on the teeth adjacent to the gap and the pontic fits in the gap. A cantilever bridge consists of a pontic and two dental crowns, but the layout is different. The crowns fit over two teeth on the same side of the gap and the pontic is placed into the gap. A Maryland bridge consists of an artificial tooth attached to a metal framework. The framework, which looks like two metal wings attached to each other, are bonded to the back side of the adjacent teeth to the gap to support the pontic, which is placed into the gap. Maryland bridges are typically used to replace front teeth. 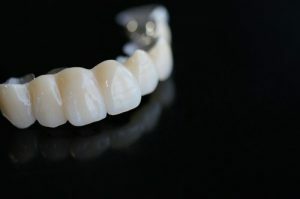 Bridges can be made of several materials, including metal ceramic, ceramic to porcelain substrate, or all-porcelain. All materials are safe and durable. We will make our recommendations on the type and material for your bridge based on your unique needs and goals. Once we have recommended a bridge for you, we can begin to prepare the supporting teeth to accommodate the bridge. This may include removing a small amount of tooth structure so the dental crowns can fit properly. We will also take impressions of your teeth, which will be sent to a dental laboratory and used to fabricate your permanent bridge. We may place a temporary bridge in the meantime. It usually takes two-three weeks for dental bridges to be ready. At that time, you will return to our office so we can replace the temporary bridge with the permanent one. The bridge will be cemented into place using a strong dental adhesive. We will check your bite and make any last adjustments to ensure the right fit and comfort. With the proper care, dental bridges can last for many years. Your bridge should be brushed and flossed as normal. Routine dental checkups are important so our team can monitor the health and function of your teeth and bridge. To find out if a dental bridge can restore health and beauty to your smile, schedule an appointment with Cobblestone Park Family Dental. Contact us by calling (405) 603-8520 today.